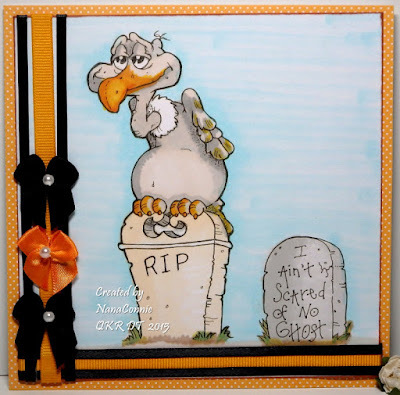 The October Digi of the Month challenge has already started over at Deedee's Digis. 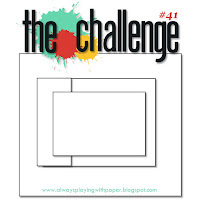 If you played in this progressive challenge last moth, you should have already received your freebie image for this month. 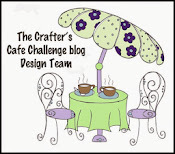 If not, please contact Deedee through the challenge blog so that it can be sent to you. The set this month is called "Pumpkin Patch" and there's a photo of the full set at the bottom of this post. 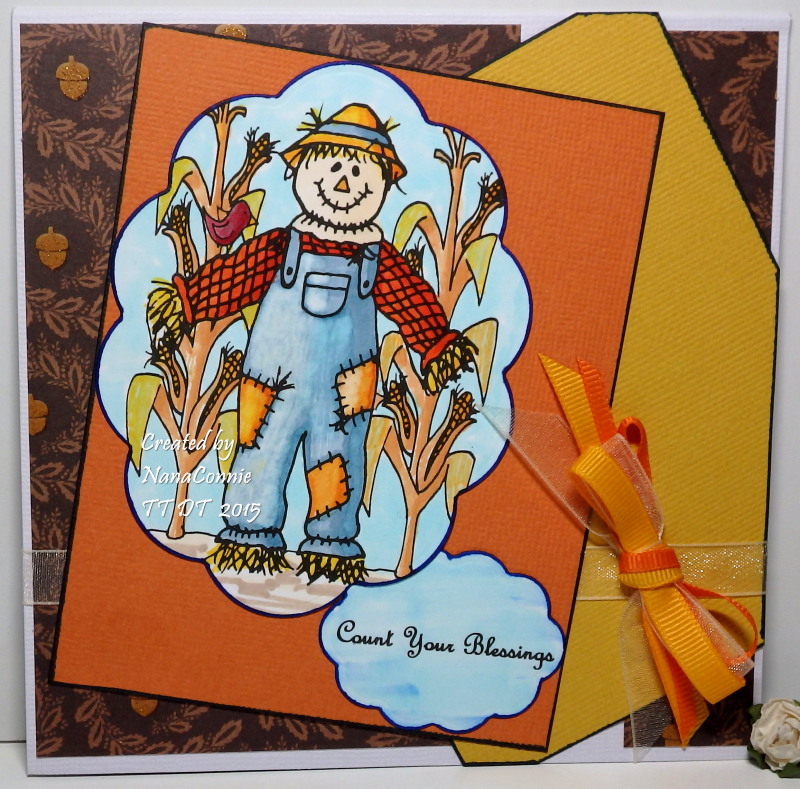 For my card, I used the pre-colored image, used ProMarkers to add the sky and to color the scarecrow's shirt so that it was more red. All the leaves were individually hand-punched from scrap bits of CS, then added around the edge of the image, one by one. That piece was adhered to a card base made from shiny CS. I 'dyed' a white bow with a marker to get the shade of orange I wanted. The sentiment is also from the set. 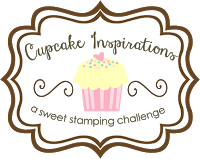 There's a new challenge starting today over at Tuesday Throwdown and we have Sugar Pea Designs sponsoring us this week. 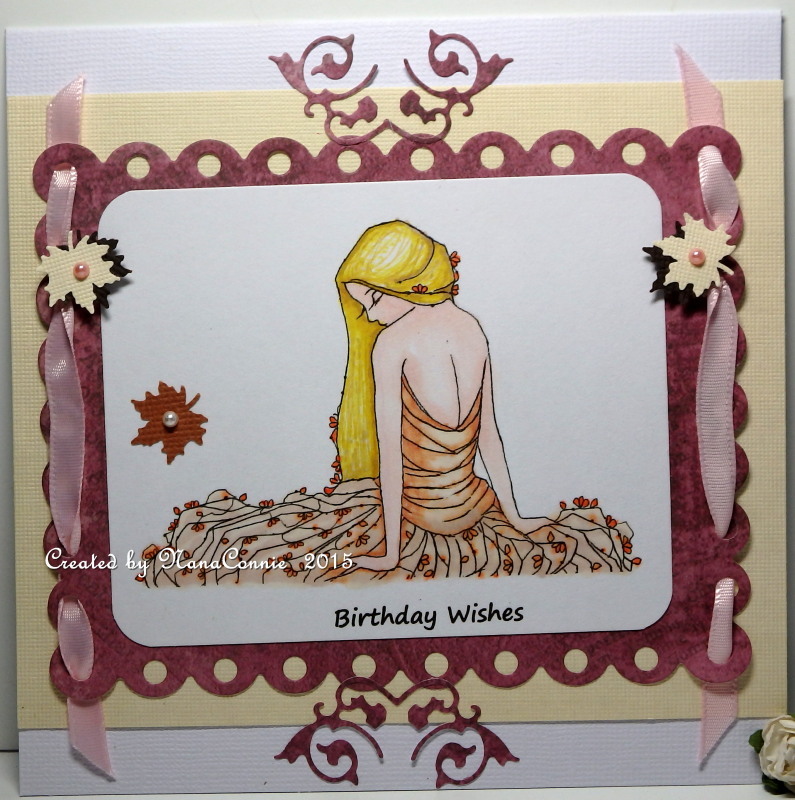 Our theme is "Clean And Simple" (CAS), meaning lots of open space and minimal embellishment in the card design. 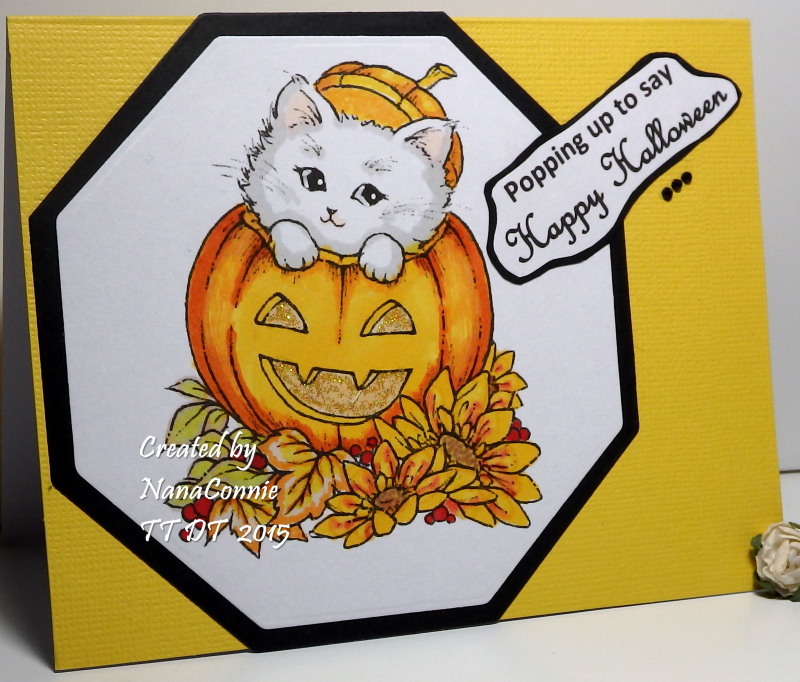 I chose to do one last Halloween card because I simply couldn't resist this precious kitten peeking out of a pumpkin. I don't have any Sugar Pea images in my collection so I used an image from AuroraWings. I colored the image with my ProMarkers, deciding right away that this was a little white kitten, not a black cat. 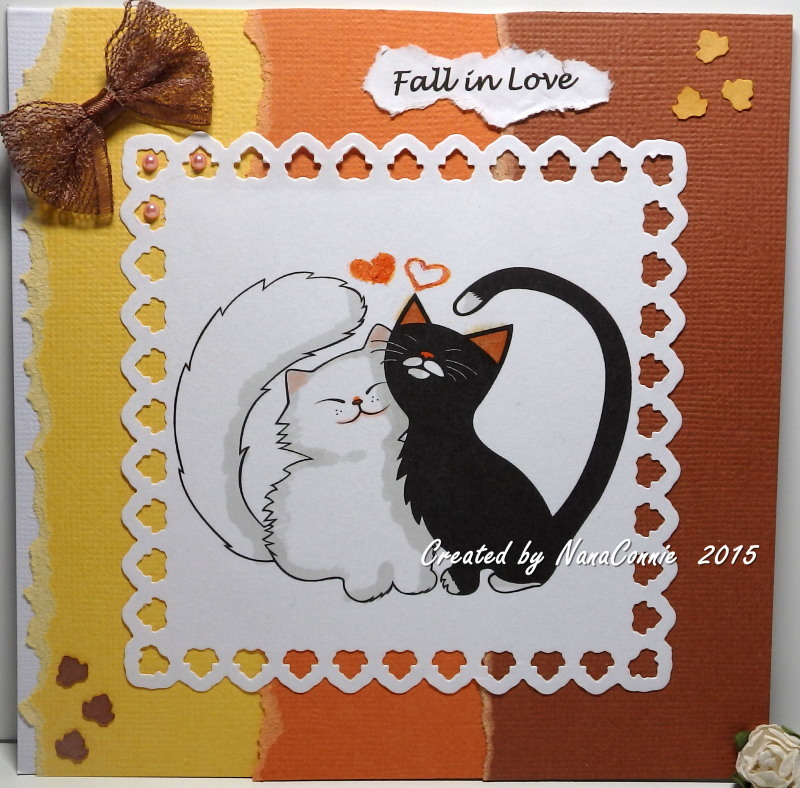 :-D I also decided to use my three favorite fall colors (goldenrod, orange and black) instead of the typical Halloween colors. I added glitter to the pumpkin face and waited for it to dry. Then, I cut the image with a hexagon die from QuicKutz and matted it with another die cut one size larger. Everything went onto a yellow pre-made card base. I added the matted sentiment and three, tiny, black rhinestones, then left it alone. 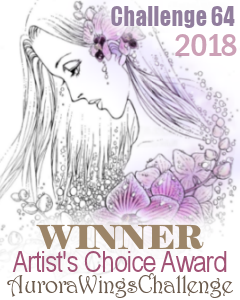 The entire card, including the coloring process, took less than 45 minutes but it also gave me a chance to use up one more pre-made card base from my stash. Picking apples every fall is a warm and wonderful childhood memory of mine. The whole family would go up into a high foothill community, appropriately named Apple Valley, and pick at least 5 bushels of apples, combining sweet and tart, juicy and crisp, and in all possible apple colors. They were stored in the cellar and we had apple pies, applesauce, baked apples, and Waldorf salads, to say nothing of slipping down into the cellar just to pick out that one perfect apple to go into the lunchbox for school. I colored the image with ProMarkers, cut it with a die from Spellbinders, and threaded the ribbon through it. I adhered the piece onto a colored card base and called it finished. How's that for something really CAS which has an elegant flair to it? There's something about autumn and the cooler weather which means it's time to break out the coffee pot & mugs and put away the ice tea pitcher & lemonade glasses. 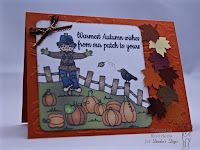 I'm celebrating that coming of autumn with this card, hoping that, finally, it might bring on that cooler weather. We're so tired of hot, hot, hot out here in dry and drought-stricken California. 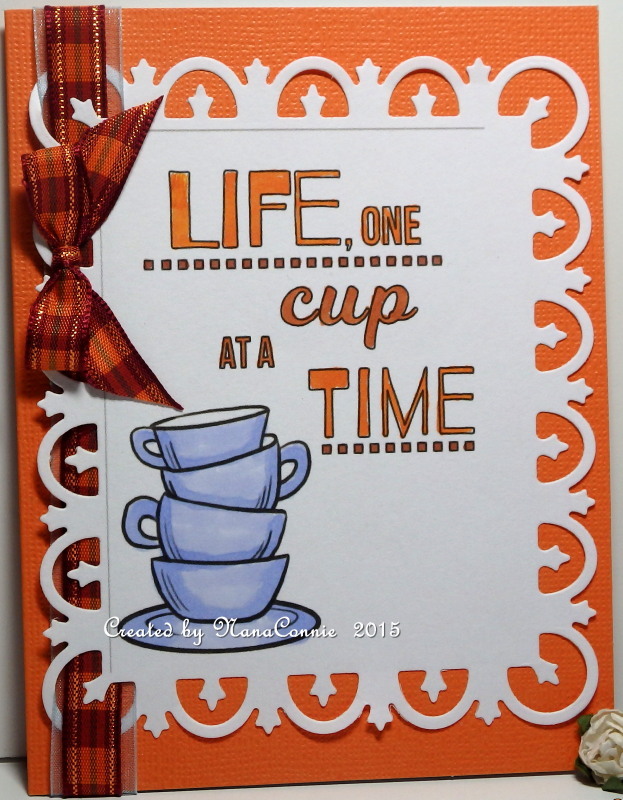 Paola, at My Whimsical Little World, has done several of these coffee and teacup images and it was through her that I heard about the Coffee Loving Cardmakers blog hop for National Coffee Day. 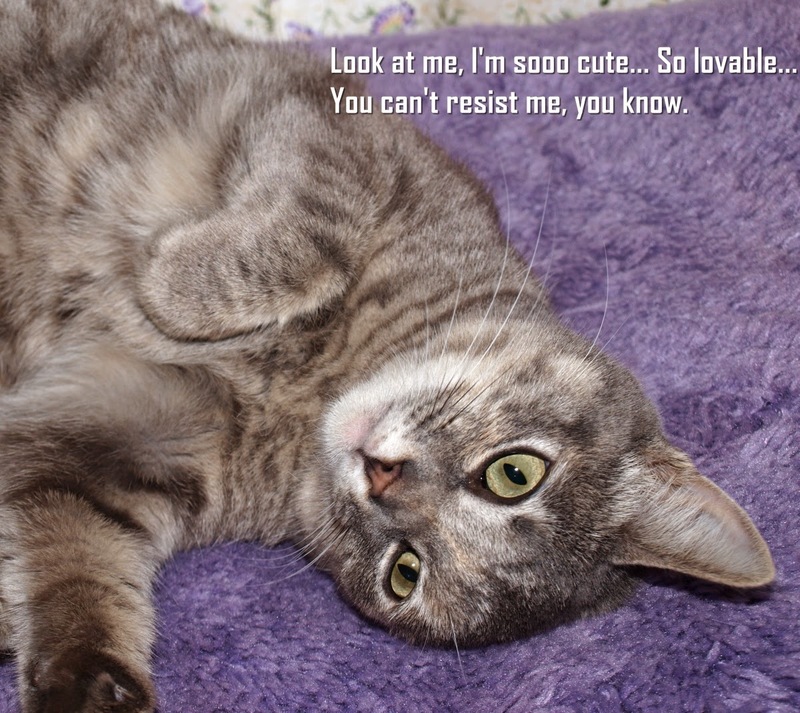 She's one of 42 different sponsors! 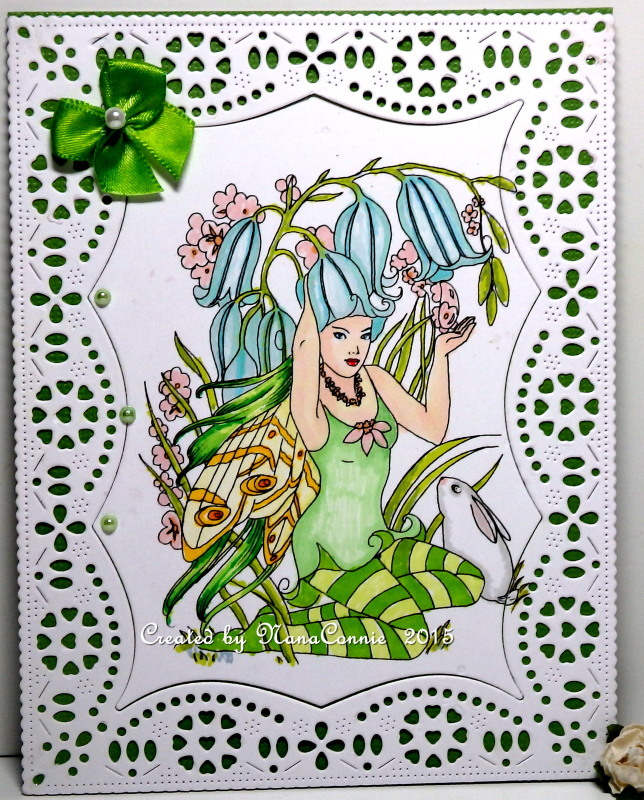 I colored the image with ProMarkers, then used a Spellbinders' die to cut it. I added the ribbon, put everything on a colored card base, and beyond that, left it pretty simple. Yesterday I shocked many of my followers by posting a card with a dog image instead of a cat so today, I'm making up for that. 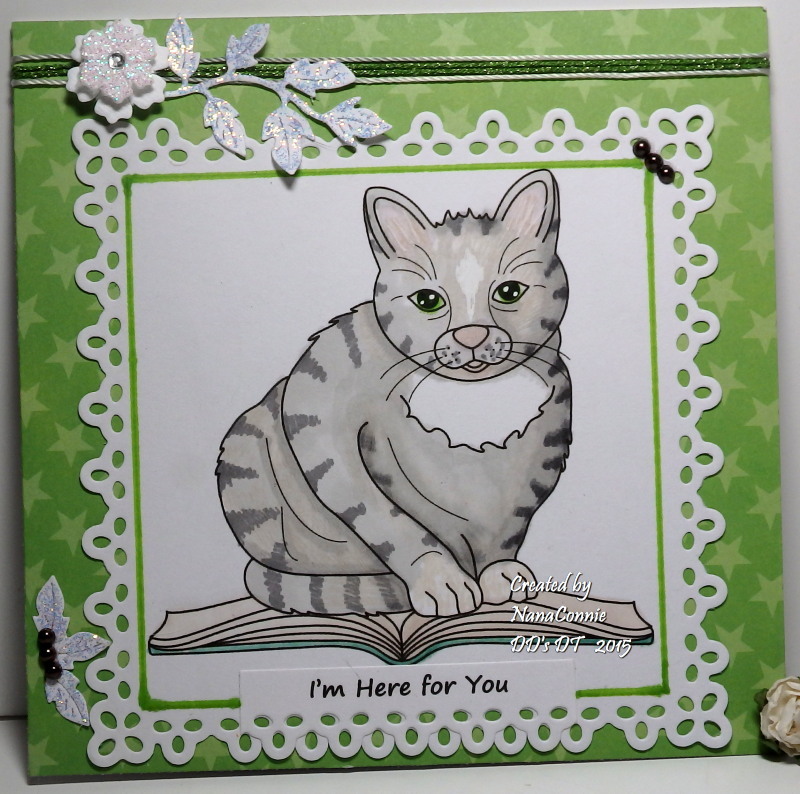 :-D This sweet feline "Homework Helper" is from a set of the same name available at Deedee's Digis. See the photo of the full set at the bottom of this post. 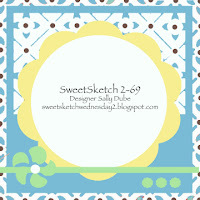 To make this card, I started with a sketch from Sweet Sketch Weds. but flipped it, top to bottom. The image is colored with ProMarkers and cut into a square. I inked the edges and layered it onto a die cut, square, lace doily. That went onto dp from Forever in Time, their "Perfect Prints" pad. I added sparkly ribbon (made with twine and narrow double stick tape), then a two layer flower to which glitter had been added. 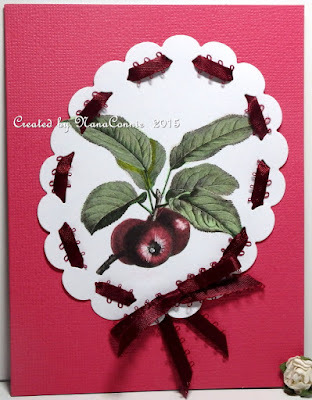 I used another of my favorite die cut leaf stems (Cheery Lynn) with glitter added to those also. I put a full stem of leaves above with the flower and three individual ones at the lower left. Finally, I added the small pearls to the three leaves and to the opposite corner above. Although this feline is supposedly helping with homework, I think it would be a great card just to tell someone they're not alone. Actually, I'm a crazy ANIMAL lady! 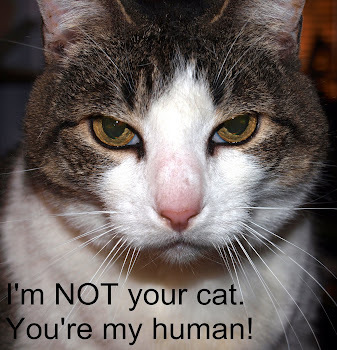 I love cats and dogs equally but for the last few years, it's been the felines who've let me share their home, feeding and caring for them, cleaning their litter box and otherwise tending to their demands needs. <--They made me change that! This image (Digi 6601 "Spoiled Dog" & Digi 14619 "Dog's Life") was colored with ProMarkers then cut with a die from Spellbinders. The sentiment was hand cut, inked on the edge, and adhered to the image piece. 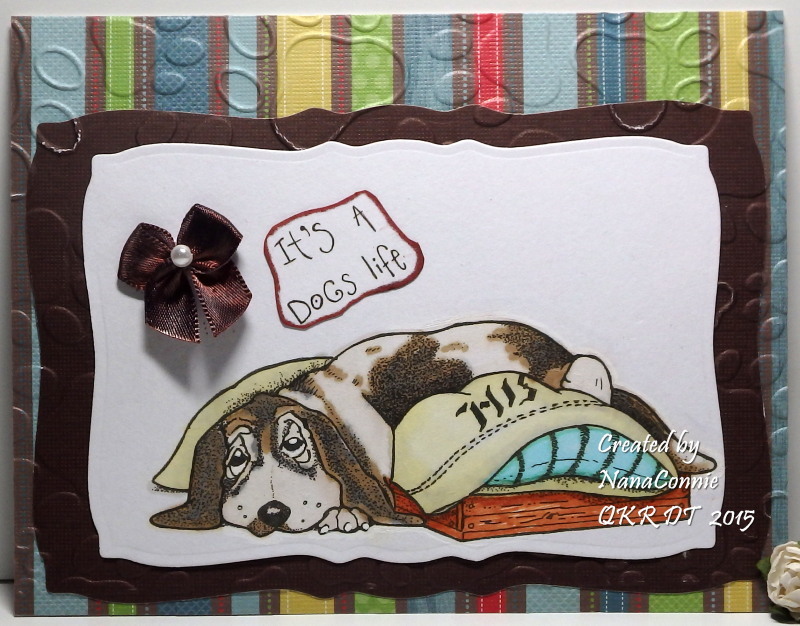 I also die cut a mat out of dark brown CS, layered it onto the striped dp (DCWV) and ran both of those layers through an embossing folder to make the pawprints. I added one of the small bows I make and used it as the only embellishment since this card will be for a guy. How's this for a perfect, fall wedding, bridal shower card? The shower decorations are all being done in fall colors. 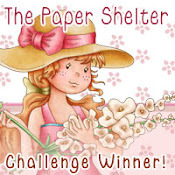 The image is from The East Wind, where their current FB challenge has a theme of "Lovin' the Animals." My colors were inspired by Our Crafty Corner. 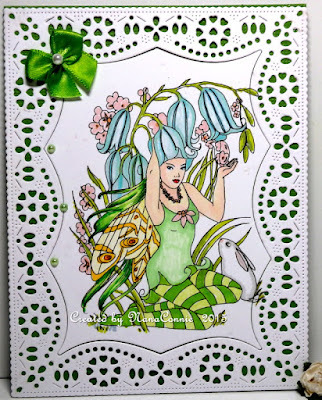 The image is colored with ProMarkers, then die cut with a die from Spellbinders. I took a few of the leaves which were bits that dropped out of the die cut, colored them with ProMarkers, and used them for corner embellies. The background CS (all from my stash) is hand-torn and layered onto the card front. Each piece was run through my "Linen" folder before tearing. The bow is made from hem tape lace and I 'dyed' it with ProMarker to get the color I wanted. I was looking through my huge collection of images from Doodle Pantry, and ran across this Magnolia Blossom. I've had that image for more than three years and this is the first time I've used it. It just struck me that, as a lovely white flower, it could make a beautiful Christmas card. I printed it twice, once on green CS and again on white. I outlined the one on CS with white gel ink. I also printed the sentiment onto the same green CS and then went over it with white gel ink, too. The colored flower was fussy cut and mounted atop the green CS flower on Pop Dots. I matted both the image and the sentiment with white CS and layered them together set at angles to each other. I found the background dp in my Christmas stash (something else in my stash for more than a year.) The ribbon and the twine were scrap pieces just waiting to be used, and the holly leaves are actually shank buttons. So, don't you agree this was a good image for Christmas? 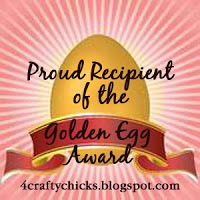 We're at the mid-way point of the challenge at Quirky Crafts where I'm one of the Guest Designers this time around. 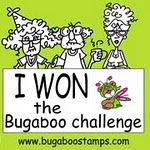 They have two marvelous sponsors; last week I used an image from Sweet Pea Stamps and this week, I'm using Bugaboo Stamps. The theme is "Animal Magic" so I thought this fun Halloween silhouette (called Skull Tree) from Bugaboo, with a cat, an owl, and a couple of bats was perfect. This is a really CAS design. It's also a new design technique I've not tried before. I printed the silhouette image and the sentiment directly onto colored CS, then cut it to size for the black card front. 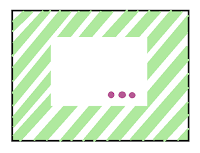 That gave me a single layer card which looked like two layers. There was no coloring involved (extremely unusual for me and part of doing something new) but I added a blingy look by using three different colors of glitter on the skull faces, the jack-o-lantern, the animal's eyes, plus a tiny touch of red on the spiders' tummies. 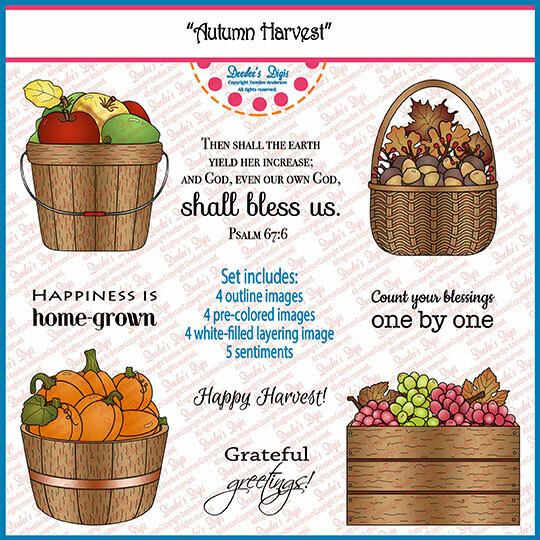 We start a new challenge at Pile It On today and we have a fun palette of autumn colors for our theme (see below.) 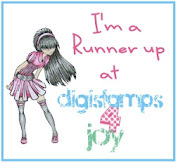 Digital Delights is our sponsor and they generously provided images for the DT to use. 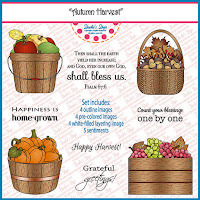 As it happens, I have quite a collection of Digital Delights digis so I used "Pilgrim Boy" and "Pilgrim Girl" from my own collection and then added the sentiment which was provided to the team members. ...and below is my card. After I got it all layered together, including the ribbons, bow, and pearls in the one corner (all from my stash! ), the olive green CS just wasn't working. I dug through my ProMarkers, found a lovely light olive green shade and colored in her apron. I also punched a few leaves from the olive CS and layered them on top of the image. Instantly, the olive CS fit right in! 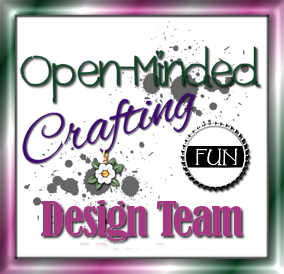 My third week as a Guest Designer on the Sunday CAS challenge at The Outlawz and I'm truly enjoying it. I've done a couple of very simple cards so far, and this week is also CAS but with some layers and dimension used in the design. We have a new theme this week and it's one everybody loves - Anything Goes! 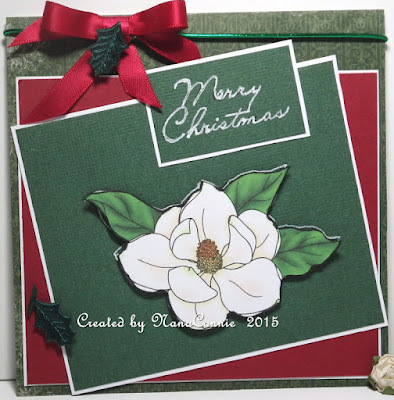 I used an image from Sweet Pea Stamps called "Sugar and Snowball" and took the opportunity to add one more card to my Christmas stash. and colors taken from Color My Heart. I used my ProMarkers to color the image and then cut it into a square. 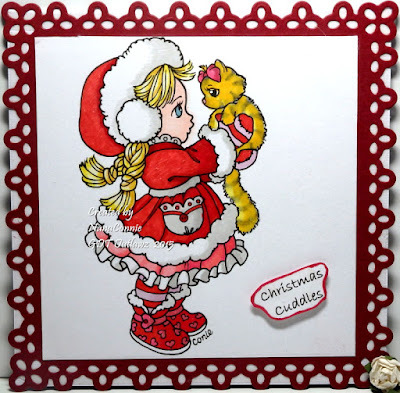 The red CS I used for the die cut frame has been hiding in my Christmas stash for nearly 3 years. It's very heavy duty and one side is polished so that it shines. This time, I chose to use the matte side because it worked better with the image colors and was much easier to photograph. Once matted, I added the entire piece to the card front, giving me layers but without a lot to distract the eye. Afterall, I was after a CAS design but I wanted some layers and texture. 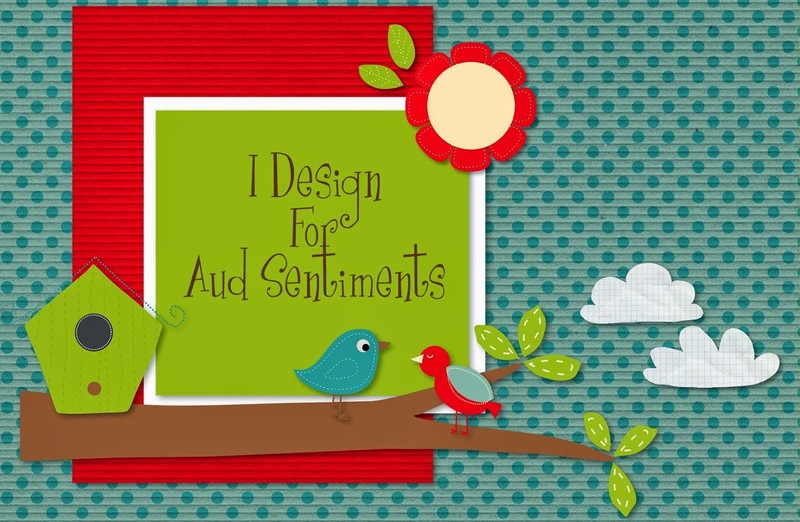 The sentiment is printed, hand-cut and matted, and adhered with dimensional dots. 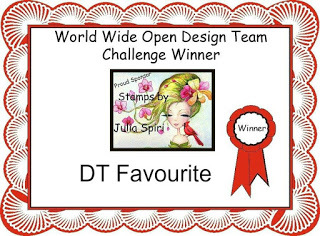 This beautiful lady was a freebie from A Day for Daisies where their challenge theme is "Frame It." As soon as I saw the image, I just knew she called for soft, fall colors - almost pastels rather than the usual bright oranges, reds, and deep yellows. Even without those bright colors, I wanted her to be "Autumn" without question. What do you think? 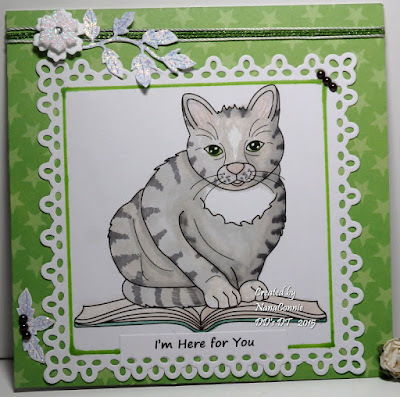 I colored her with my ProMarkers, cut her with my paper cutter, rounded the corners with a punch, and die cut the background frame from a scrap piece of dp with one of my dies from QuicKutz. I threaded the two ends with ribbon from my 'bits and pieces' stash, then mounted the matted image onto buttercream CS. That entire thing went onto a white card front. 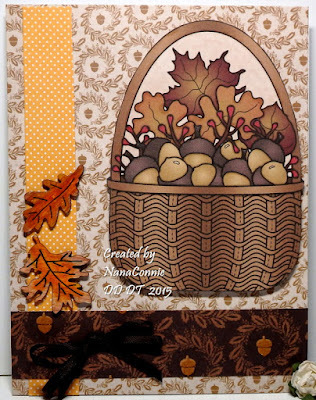 I added fall leaves and pearls and then used the negative, drop-out pieces from a decorative-corner die (Cheery Lynn) on the top and bottom of the framed piece, adding a delicate filigree flair to the overall design. Another silly card for the challenge starting today at QKR Stampede. Our theme is "3s a crowd" meaning we want to see 3 of something on your card. I used three strips of ribbon and three bows. I actually combined two images, one of which I used as the sentiment: Digi 13610 "Old Buzzard" and Digi 13604 "Ain't Scared." Another of my Halloween cards. The image is colored with ProMarkers. I cut the image with my paper cutter and inked the edges with distress ink. The polka dot paper is from Lawn Fawn and the ribbons are from my stash. 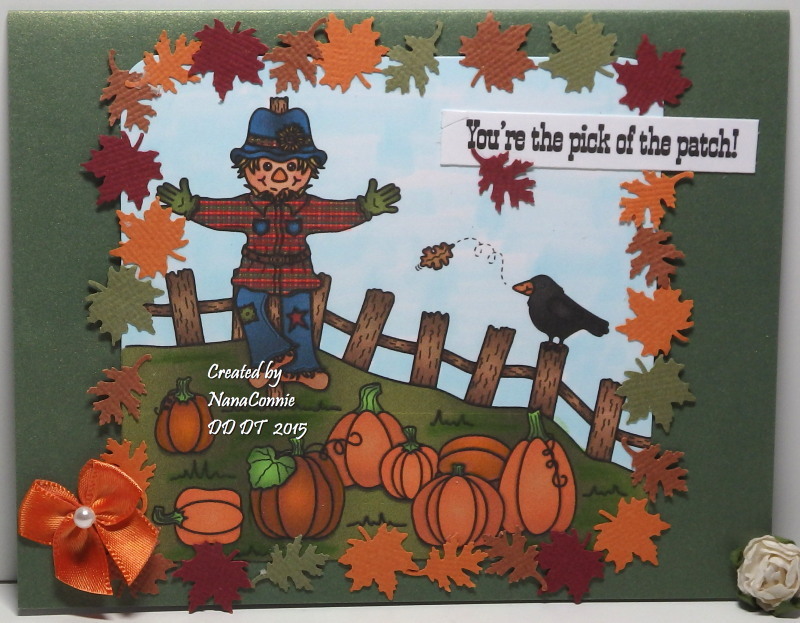 I'm sharing a new card today, made with one of the images from Deedee's Digis Autumn Harvest set. There's a photo of the full set at the bottom of this post. And here's the inside with the sentiment from the set. 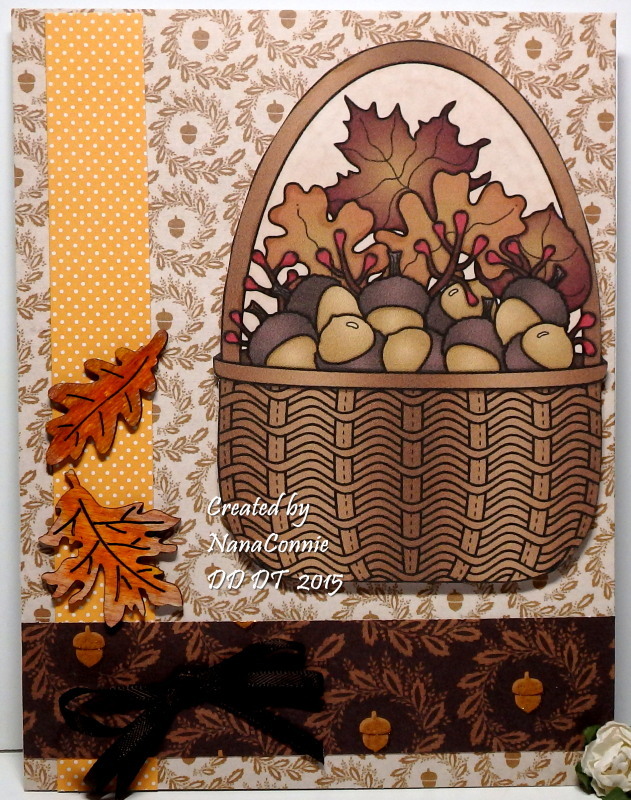 I printed the basket image and fussy cut it before layering it on pop dots on top of the three different dp scraps I used. I added the double bow of narrow, satin ribbon and the two wooden leaves which came from my stash. 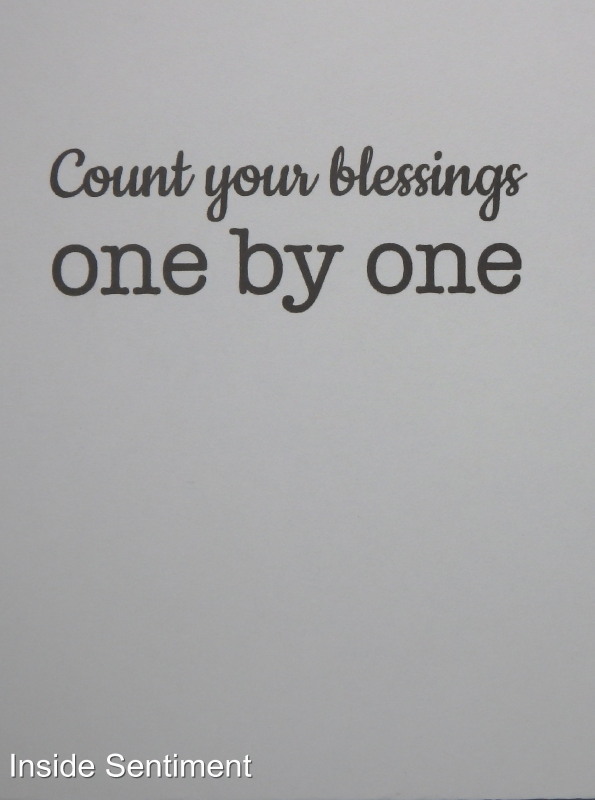 I think this is a perfect masculine card for Thanksgiving or just gratitude in general. I know this is a very brief post but I have appointments scheduled this morning and must post this before I leave. I hate spiders, I really do. I can't even stand looking at photographs of real ones and I definitely don't want to see them creepy-crawling up the wall or across the floor. 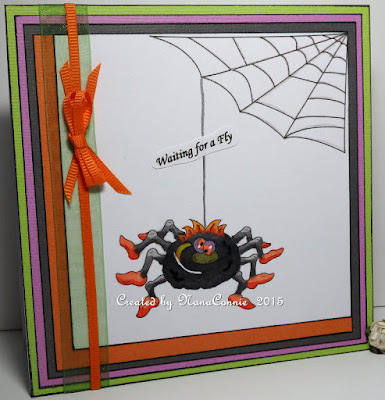 But when I saw this freebie image from Judy at Blue Jeans, Coffee and Friends, this goofy little spider was so cute, I just had to use him for this card. Thanks, Judy!! It's very early on a Tuesday and that means a new challenge at Tuesday Throwdown. Our theme this week is "For a Child" and our sponsor is Sweet n Sassy. 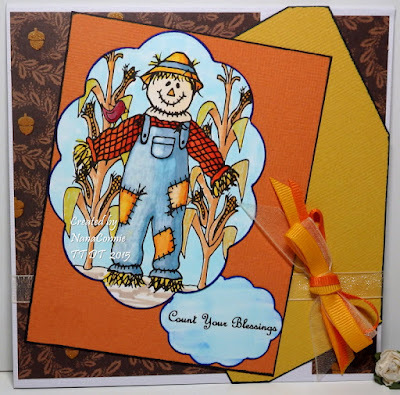 They generously provided images for the team to use and I chose to use "Happy Scarecrow." He just looks like something a child put together and is a perfect image for a happy child's card. and angling things a bit differently. 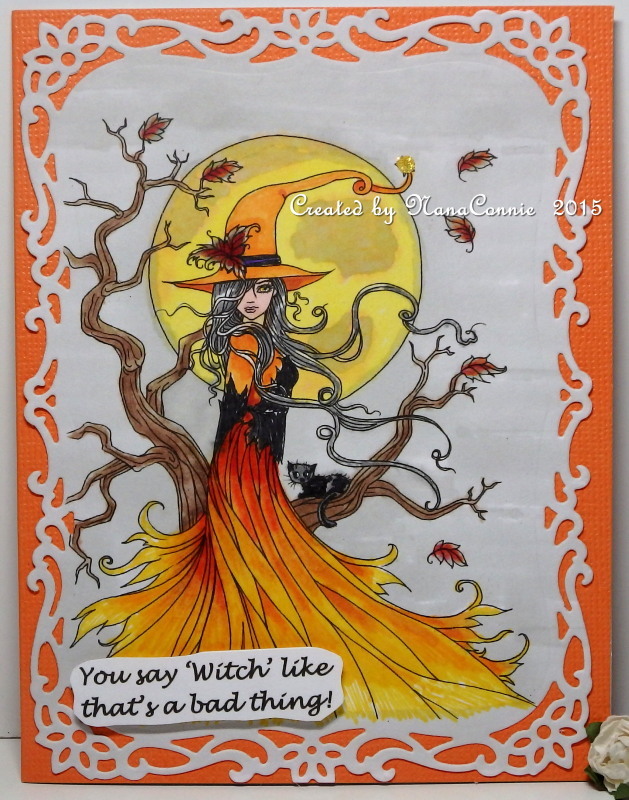 The image is colored with a combination of ProMarkers and Copics, then die cut with a die from Spellbinders. The sentiment was printed and also die cut. I used sheer ribbon to wrap the card and the tied a triple bow with that same sheer ribbon plus two others that were all in my stash. All the papers and card stock pieces were scraps left over from other fall themed cards I've been making this past week. I always feel so good when I can use up scraps -- like it gives me permission to cut into a new, full sheet of something for the next project. :-D Because this is a boy card, the bow is the only embellishment. 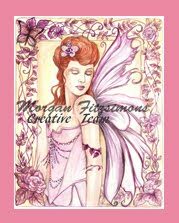 I love fairy images and when I find a new one, I just have to grab it. 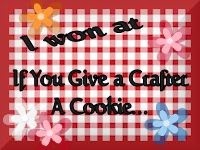 This one I bought at Sweet Pea Stamps so that I could begin entering their Progressive Challenge on their FB page. I missed out on playing last month so I'm starting this month. The image is called "How Do I Look?" and I love that she's trying on various flowers as hats. Obviously, her tiny bunny friend is offering an opinion. What do you think? 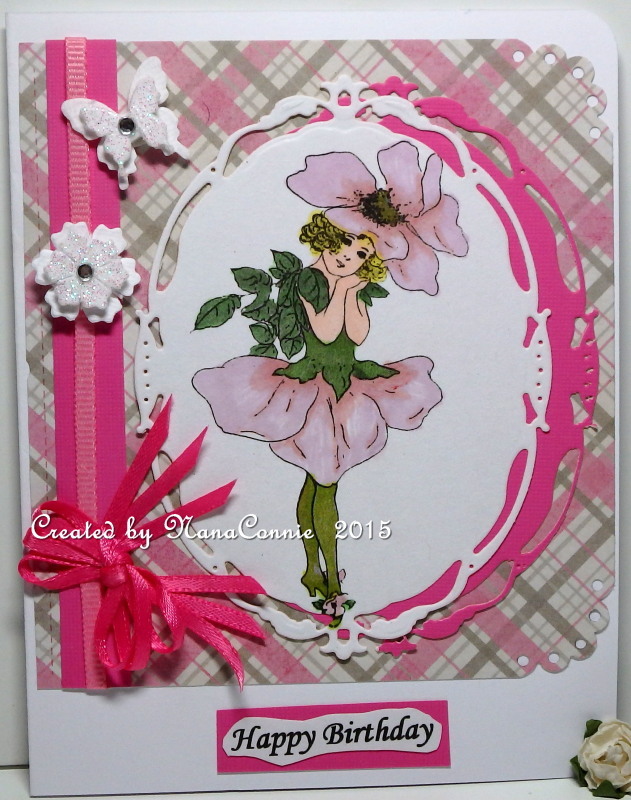 I was influenced by the simple sketch at Die Cut Divas, turned on end. 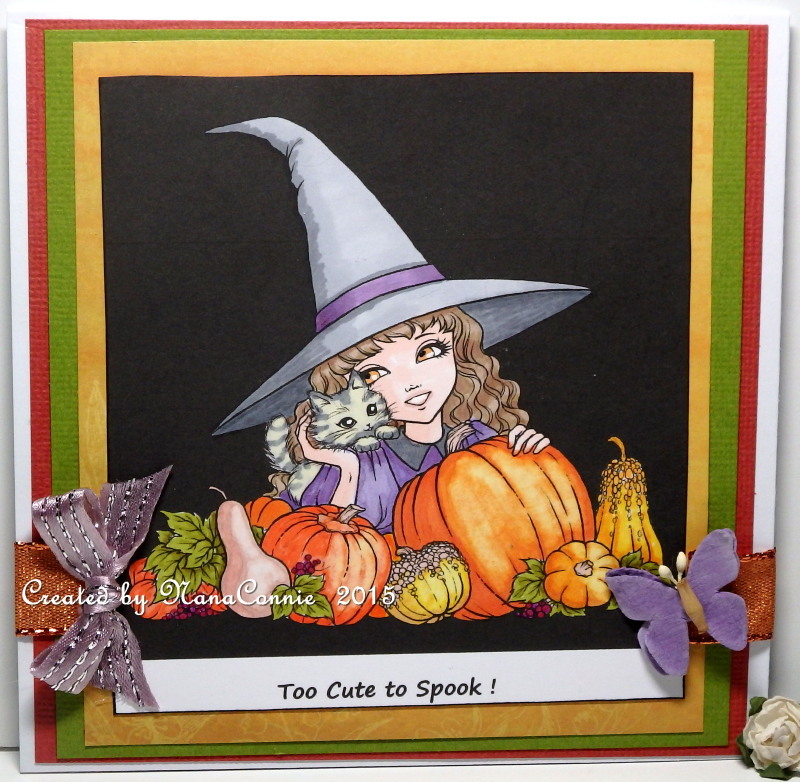 The image is colored with ProMarkers and a couple of chalk markers and then cut with a Cheery Lynn die. These are my favorite kinds of dies -- the ones which make a fancy, delicate frame around the image allowing a CAS design which doesn't look at all CAS. Usually, I separate the inside and outside pieces, and use a colored piece for the outside frame. This time, I kept both pieces together and mounted them on top of forest green CS, cut to size. For embellishments, I kept it minimal by adding only three small pearls on the left side and one bow, handmade and 'dyed' with marker to get the shade of green I wanted. 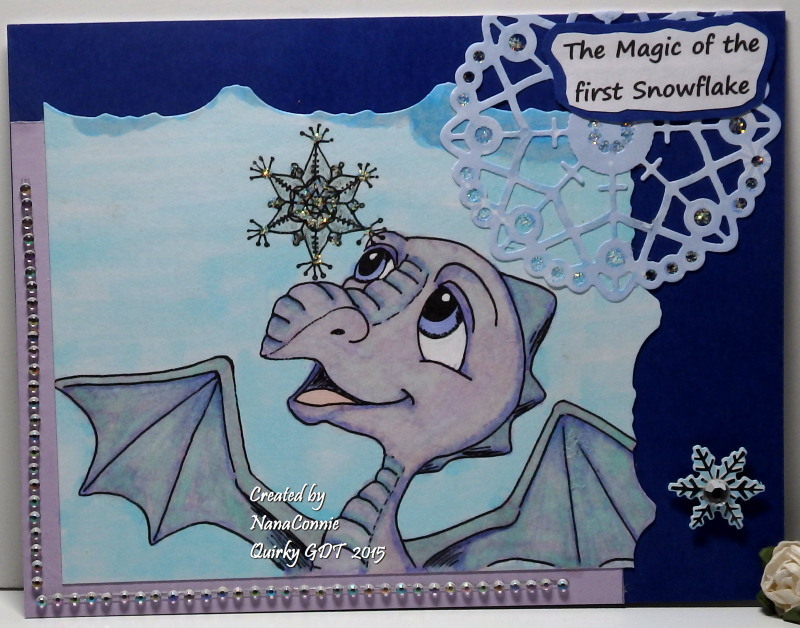 I added some sparkle to the snowflake and cut the image piece by using a square die as a border die on two sides. What you're seeing is the 'outside' of the die cut. I added a large, die cut snowflake (Cheery Lynn die), and put some sparkle on it before layering on the sentiment. The tiny snowflake embellie was in my stash. I added the bling of two rows of small rhinestones to the lower corner. 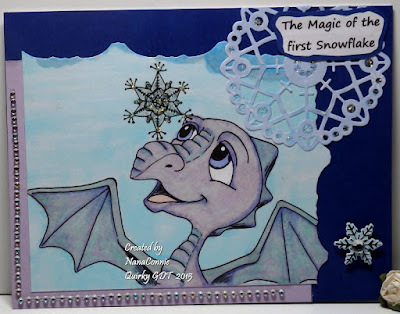 Lots of glitter and bling on this card which celebrates every child's wish for snow on Christmas. 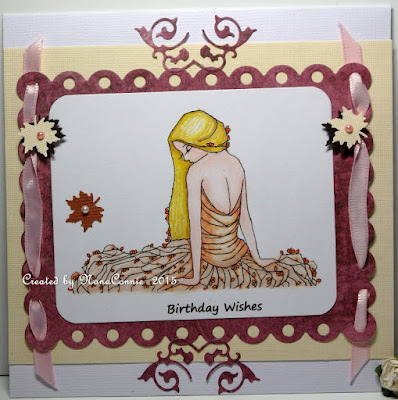 This is my second card as Guest Designer for the CAS challenge at The Outlawz. Our theme this week is "Musical" -- and that can have a wide interpretation. 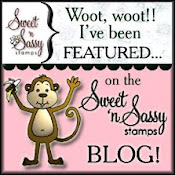 I chose to use a rubber stamp image from Sparkle n Sprinkle, one I've had for a long, long time (before I even started blogging!) but still love. In fact, this card is overwhelmingly filled with Sparkle n Sprinkle goodies -- embossing powder, glitter, and image. and colors came from Connie Can Crop. 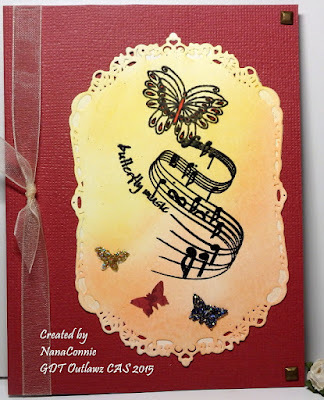 Before stamping my image, I used chalks to color and blend the background and then I stamped the image with embossing ink, used black EP and heat set it. I used ProMarkers to add a bit of color to the butterfly in the image. 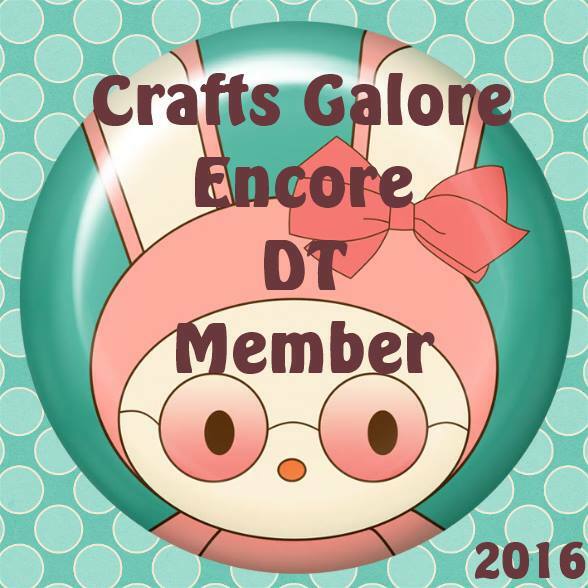 I die cut it with one of my favorite types of dies (framing) from Spellbinders, making a fancy frame for it. The three little butterflies are die cut negatives and I added glitter to two of them. 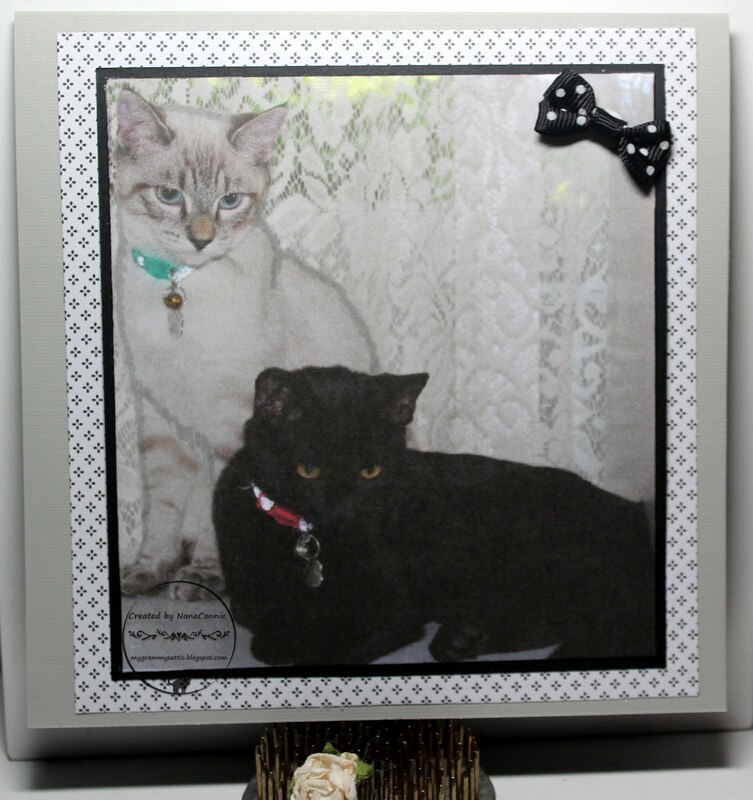 I mounted the image onto a pre-made, colored card front, added the bit of sheer ribbon and the corner brads. Another lovely, CAS design. 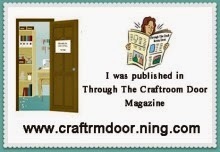 I was inspired by the colors from Our Crafty Corner. 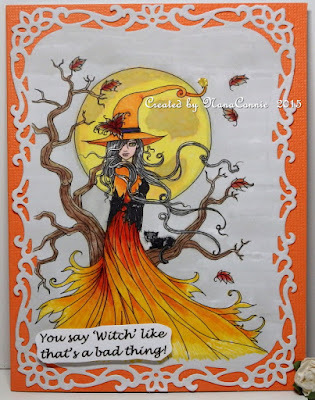 The image is colored with my Copics (where I have a better selection of fall colors) and then I used one of my framing dies from Spellbinders to cut it. I popped up the sentiment on dimensional dots and added a tiny bit of glitter to the tip of her hat. I didn't want to take away from that fancy frame or the image so there's no other embellishment at all. I like it just the way it is, frilly and feminine looking while actually CAS. Welcome to the end of the week. The weekend is just over the horizon and that means it's time for another challenge at QKR Stampede. Our fun theme this week is "Midnight Snacking" and you can pretty much define that any way you like as long as it relates to some kind of food or snack. There were so many fun images available at QKR Stampede for this one but I wanted to try coloring a cute raccoon, a new critter that I've not colored before. Do raccoons have light tummies or dark? Or is their tummy striped like their tail? Is their face light with a dark mask or dark with a light mask? 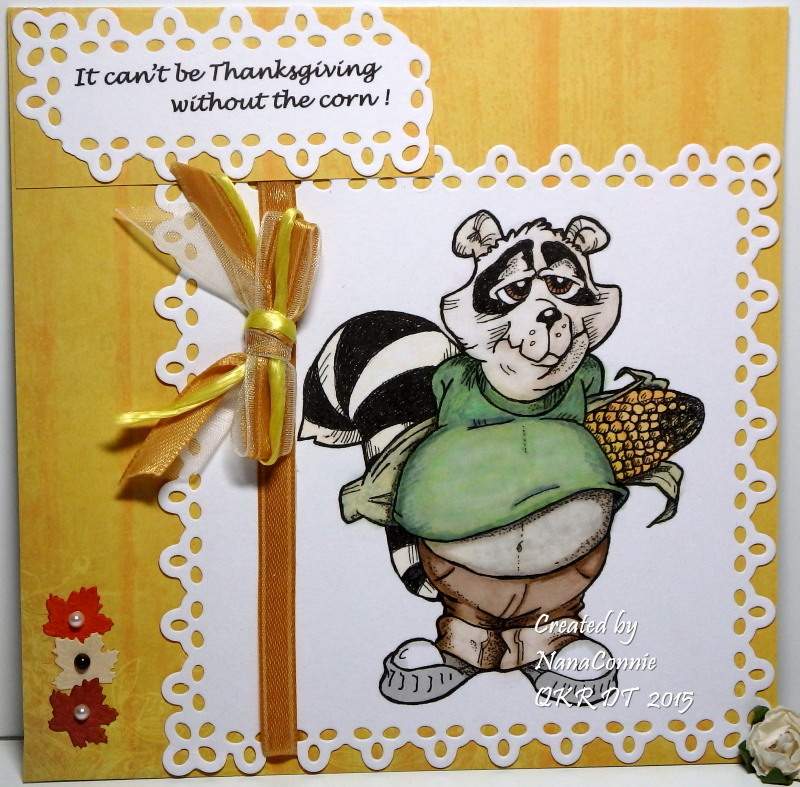 And most important for my card and sentiment, do raccoons celebrate Thanksgiving? This image is Digi 2424263, "Thieving Raccoon." Personally, I think raccoons probably celebrate anything that has to do with food. They were certainly celebrating the leftovers of my garden this week. :-D Two immature, late-setting watermelons, a zucchini, a few carrots, four or five cherry tomatoes, and three ears of corn! Still, I don't begrudge any of them -- I'm just grateful to have had a well-producing garden this year. I really missed having one last year but there was no time to get one in due to all the landscaping that was going in at my new house all that spring and most of the summer. I used colors from the Tuesday Color challenge at The Outlawz. I colored the image with ProMarkers and then die cut it with a die from QuicKutz. The sentiment is printed and also cut with a die from that same set. The dp for the background came from scraps in my stash and the three little leaves were punched from bits of scraps. The ribbons and cord were left over pieces and I tied the bow by hand, layering the ribbons and cord together before using my Craft-Dee Bowz to tie them. 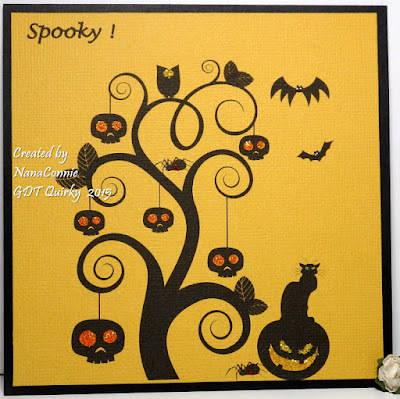 So, over the weekend I started my Halloween cards and next thing you know, one of my neighbors wants 10 cards to mail to her grandkids and nieces. Now I'm working to get all those done plus the cards I'll need for my own family and friends. 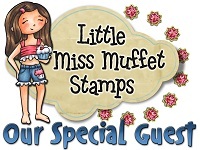 Fortunately, I keep finding all these darling stamps so there's no excuse not to get them done right away. This one is from AuroraWings. and I think I used all the colors in it. Always Playing with Paper, turned 1/4 turn. 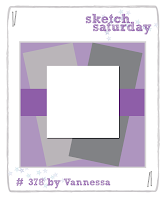 I used my ProMarkers again to color the image, then cut it with a plain square die. I printed the sentiment on white CS and added it below the image. I used one layer of dp and two layers of 'Linen' embossed CS to frame out the image and then put all of that onto a square card front. I used sparkly copper ribbon from my stash and found another scrap of lavender ribbon to make the bow. The butterfly is from Petaloo. 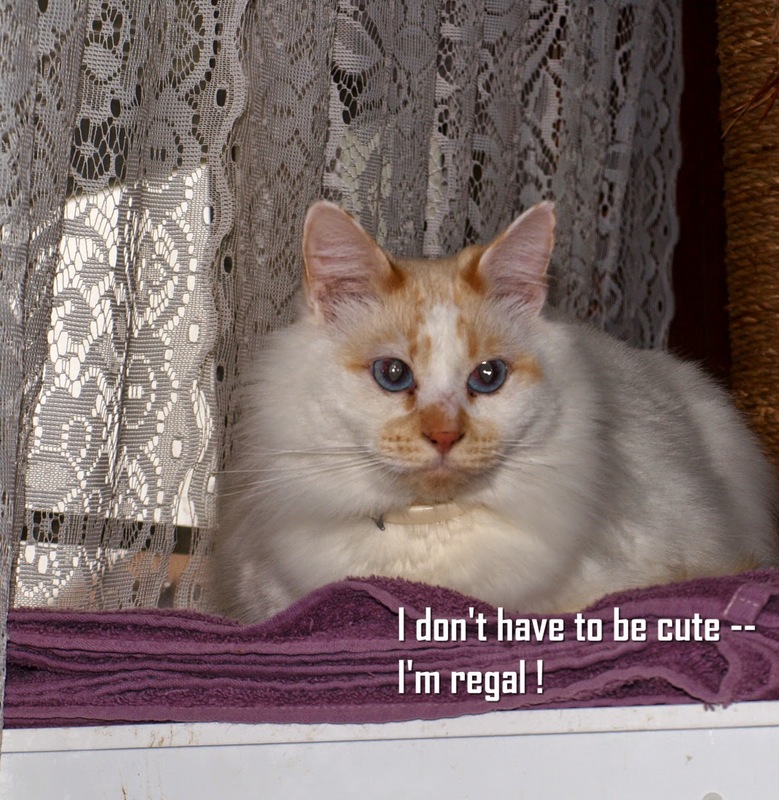 I am completely mad about this image from Nicecrane! It was the freebie this month from the Progressive Challenge at The Outlawz and I can't think of a better reason to belong to Outlawz or to keep playing in the Progressive Challenge each month. :-D It came from a set called "Flower Children." 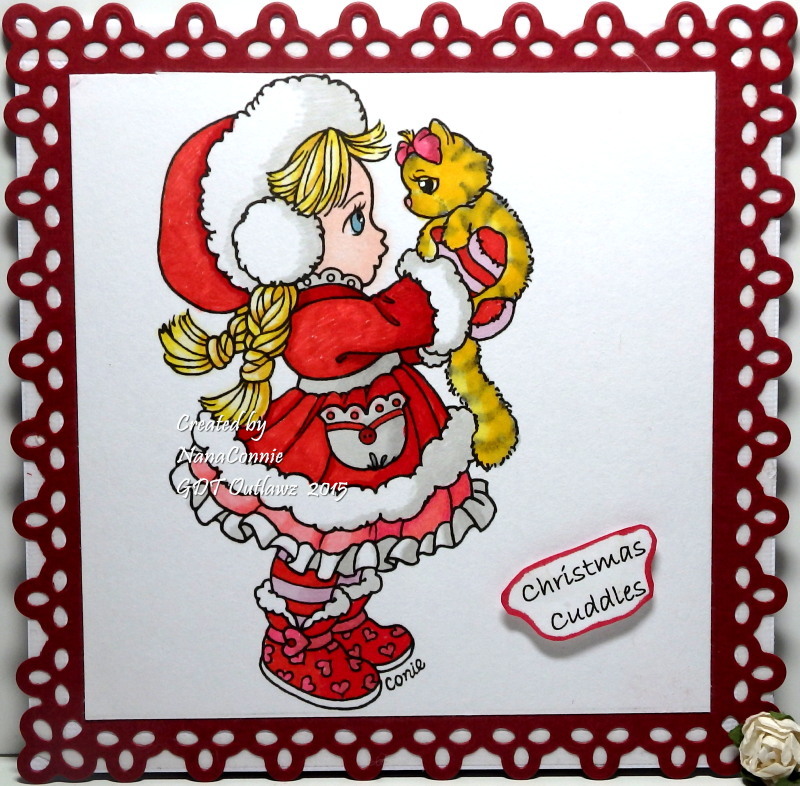 I used my ProMarkers to color the image and used some of my framing dies from Spellbinders to cut and frame her. The plaid paper is from K & Co. and had been in my stash for way too long. All the ribbons are from Really Reasonable Ribbon and I think the flower and butterfly embellies are Recollections but, again, they have been in my stash for a while so I'm not sure. I added a faint line of stitching beside the ribbon but it doesn't show up very well in the photo. It was made using a very sharp #4 pencil. The last two days, I seem to have been on a 'pink' kick but mostly I was using up scraps from the "leftovers" tub on my desk. It's time to clear things out and throw away the smallest scraps which I always think I'll use but never do. I have two photo storage boxes of little scraps which would only work if I cut them into 'inchies' for a patchwork background. Can a Witch Fly Backwards?